A classic fast and tight singletrack descent that can be part of a pedal or shuttled. Enjoy the ride, a number of trickier spots, and the views on this great trail! 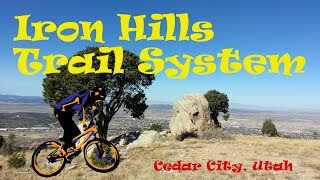 Over four miles of singletrack starts from the "C" parking lot located above the whitewashed C rocks on Cedar Mountain. The trail begins on the west side of the parking lot and quickly drops into a grove of aspens that supply a cool sensation, but also can make it hard to read the singletrack ahead. Several switchbacks crop up at the start and keep showing up unexpectedly all the way to the bottom. 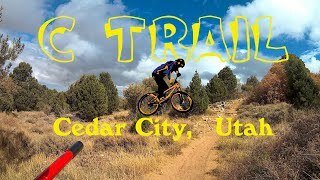 There's plenty of opportunity to catch the scenery on some of the more relaxed sections of the trail, so keep an eye out for the great view of Cedar City! There are two pedaling sections; one is a very steep, challenging climb that culminates with two tight switchbacks topped off with a tricky rock to maneuver up before reaching the top. Shortly after that, riders will be greeted with the opportunity to hang a left onto Highlands Trail, which would take you to the Greens Lake Trail for another very fun ride. Continuing down the C-Trail shortly reaches a longer, much easier, pedaling section that's followed with more downhill fun! The trail continues down through more switchbacks and straightaways. At the bottom, the grade fades away at a doubletrack section that leads to the lower parking area. It's smooth sailing heading south on the C Trail.